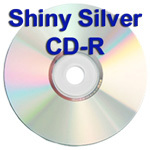 Silver Lacquer CD-R is a CD-R with a very thin (if any) layer of lacquer coating on the top surface of the CD-R. Professional duplicators refer to these discs as silver lacquer CD-R. The top surface is shiny silver and thus they are also named shiny silver CD-R. Shiny silver CD-R is best used when you simply want to write on the surface to identify the contents of the CD-R or you have a monochrome thermal printer such as a Rimage Prism printer. Listed below are all brands that we offer with a shiny silver top surface. 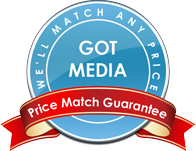 Gotmedia CD-R is our house brand. These CD-Rs have a shiny silver surface which is best suited for users that want to print with a monocolor thermal printer, offset print, silkscreen print, apply a label or just simply write on the surface with a CD pen. These are hub printable which means you can print on more of the surface and closer to the center hole. There is no groove (stacking ring) on the top surface. MAM-A Mitsui CD-R has a reputation that is synonomous with superior quality. This Mitsui CD-R has a shiny silver surface for users that want to print with a monocolor thermal printer, apply a label or just simply write on the surface with a CD pen. MAM-A Mitsui CD-R has a reputation that is synonomous with superior quality. This Mitsui CD-R is a 650 MB/ 74 Minutes capacity and has a shiny silver surface for users that want to print with a monocolor thermal printer, apply a label or just simply write on the surface with a CD pen. MAM-A Mitsui CD-R has a reputation that is synonomous with superior quality. This Mitsui CD-R is a 650 MB/ 74 Minutes capacity and has a shiny silver surface for users that want to print with a monocolor thermal printer, apply a label or just simply write on the surface with a CD pen. These are packaged in a Jewel Case. MAM-A Mitsui Digital Audio CD-R 11066 has a shiny silver top surface which is suitable for paper labeling, printing with a thermal printer or using CD Pen to write on the surface. This is a bulk packaged MAM-A digital audio CD-R.
Spin-X CD-R has been popular among consumers and professional duplicators for years. These CD-Rs have a shiny silver surface which is best suited for users that want to print with a monocolor thermal printer, apply a label or just simply write on the surface with a CD pen. Spin-X Diamond CD-R is recommended if you are looking for a recordable CD-R with no color on the record side. Silver CD-Rs have a green hue to the record side whereas the Diamond CD-R is pure silver. These CD-Rs have a shiny silver top surface which is best suited for users that want to print with a monocolor thermal printer, apply a label or just simply write on the surface with a CD pen. Ridata CD-R is an inexpensive disc with great reliability, providing great value for the user. These CD-Rs have a shiny silver surface which is best suited for users that want to print with a monocolor thermal printer, apply a label or just simply write on the surface with a CD pen. Titan Media is proud to present a new line of the most affordable Silver Shiny, Metalized hub Printable CD-R in the market right now. Titan 52X CD-R have high-resolution Silver Shiny, Metalized hub. They also serve as a cost saving alternative when compared to thermal printing. Titan Media is proud to present a new line of the most affordable Silver Inkjet Hub Printable, Metalized Hub CD-R in the market right now. Titan 52X CD-R have high-resolution Silver Inkjet Hub Printable, Metalized Hub. They also serve as a cost saving alternative when compared to thermal printing. CMC Pro (Formerly JVC & Taiyo Yuden) CD-R is a premium blank CDR with excellent reliability and compatibility. These CD-Rs have a shiny silver surface for users that want to print with a monocolor thermal printer or apply a label. Verbatim Data Life Plus CD-R is professional grade with superior reliability and consistency. This Verbatim CD-R has a shiny silver surface for users that want to print with a monocolor thermal printer, apply a label or just simply write on the surface with a CD pen.